Thank you for registering for NAFCU's 52nd Annual Conference and Solutions Expo! You must log in to register. Once you have logged in, simply select the "Register Myself" or "Register Someone Else" button below to begin registration. Please make sure you save your responses to the required questions below before proceeding to checkout. If you need assistance please call NAFCU's Member Service Center at 800-344-5580. Visit www.nafcu.org/annualconference to learn more about the conference. Gain information on defense issues, learn best practices, and network with other defense credit union leaders. Includes breakfast and lunch. Please click the Add button on the left to add this event to your registration. Earn your NAFCU Certified Volunteer Expert (NCVE) certification at this optional workshop. Please click the Add button on the left to add this event to your registration. Please click the Add button on the left to earn NAFCU's Certified Volunteer Expert (NCVE) designation by taking and passing this optional exam. Attend any function throughout the conference with the exception of spouse/guest tours. Social Events Only registration includes Wednesday, Thursday and Friday breakfasts and lunches; Solutions Expo activities and receptions; and the Friday Night Event. Scroll down to add name for spouse/guest badge(s) and save responses. Unforgettable experiences await your guests in New Orleans! Our spouse/guest tour options include the best of the area. Each tour is available both Thursday and Friday, June 20 and 21, and include breakfast and lunch. Up to two tours per person are included in each spouse/guest program registration. Scroll down to add name for spouse/guest badge(s) and save responses. We will contact you on the spouse/guest tour selections. Board a private boat for a New Orleans cruise along the Mississippi River! 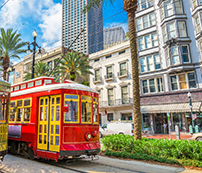 You and your adult guests will glide by the spectacular New Orleans skyline and other beautiful landmarks during our excursion. No children please (under 18 years old). Boat will depart promptly at 4:30pm and arrive back at the dock at 6:30pm. Close the week with a networking reception and show! (NOTE: one ticket is already included in each attendee, spouse/guest, and social only registration. You may purchase up to four additional tickets).